I knew that today would be a bit off. Getting up at 4AM means that this afternoon will be a bit draggy, so when I got back from the extra early dog walk, I put up a supply of extra strong iced tea. I wandered out into the predawn gloom and said hello to my neighbor Vern as he went out to pick up his paper. Going out into the city, I was mentally scratching my head. Trying to bootstrap your mind at stupid o'clock simply isn't always successful. Rack didn't care, we did a lap around town. He's getting used to his collar and now thinks it's great fun to tow me. Nope. Won't work. I'm too big. During the dog walk, I tend to let my mind wander free. My feet are, may as well let my head go. I didn't have anything pressing to write about, the weekend wasn't terribly exciting. I did bake a cake, but since it was a mix, it didn't bring anything interesting to the table. Good cake though, the addition of a moist sheen of cocoa mixed with cake batter gave it an iced look without the extra four hundred thousand calories of buttercream. Getting back into the house I started to get into the routine. I walked into the bedroom and saw the picture of Betty and her two friends in the back of Kevin's Mercedes on the rainy day we went to the Dixie Pig for barbecue. That story was so outrageous, and the picture so good, that I considered writing about it again. Coming into the Kitchen, I prepared something for the crock pot. Probably it will be done by lunch since it is so early a start. I was thinking about Betty's 95th birthday and knew she would appreciate the meal. Chicken Tikka with Yogurt, Raisins, Corn, Green Beans and either Rice or Quinoa. She loves spicy food, and Indian is one of her favorites. Slopping the chicken juice onto my clothes made for an early shower and probably an early laundry. I walked back into the bedroom and saw the picture collage there. Mom's professional picture, the view from where my brother in law Mike proposed to my sister, and the picture of Betty and the "Golden Girls". Settling down at the laptop and looking through the pictures I have here, I realized that I did have something to share. 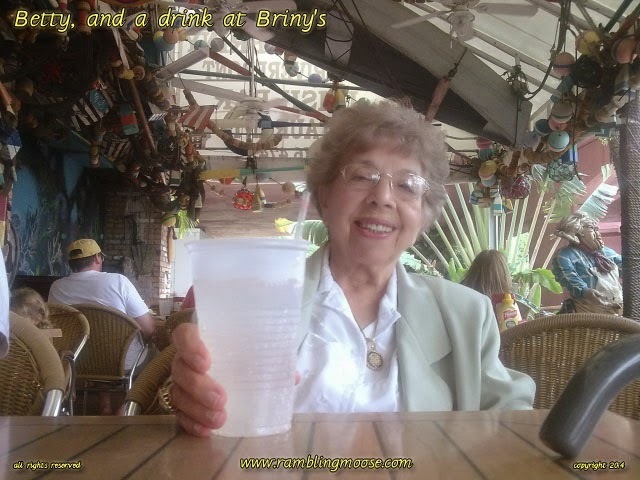 One time we took her to Briny's Irish Pub. It's a mainstay here, and up until the time of the picture, you could always get an excellent Fish and Chips. We stopped going because the chef changed and the food got less cutting edge and more mass market. How tough is it to make french fries, really? As we were sitting there, Betty had an excellent view of the New River. We watched the Andrews Avenue bridge go up and down a couple times as we had our meal. As I'm playing with the camera, I placed it on the table and told her to smile. She looks like an ad for the place. Showing her the picture in the little 2 inch screen, she squinted and said "Oh no! You can't show that picture! It makes me look like I'm a drunk!". No, not really it makes you look like you're enjoying yourself, and I think that was a diet soda. Four years ago, it's a bit difficult to remember what someone else was eating at a meal in a pub. I'm pretty sure that I went for the fish and chips with a Guinness but I'm predictable that way. Since I wasn't able to get anywhere near her in New York, the closest being the North side of town over the weekend on a dog walk, it was a subconscious celebration for me. I'm wondering if I'll ever be able to get back up there at this rate. Birthday cake, Spicy Chicken, and a Beer for us tonight. We can't be there, but we can be there in spirit. Happy Birthday Betty, 95 and counting!